It’s Christmas time! 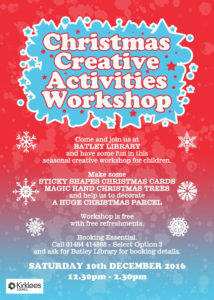 To celebrate, on the 10th December we are hosting our Christmas Creative Activities Workshop, a fun artistic session for children where we will be making special Christmas cards, a ‘magic hand’ Christmas tree and helping to decorate a giant parcel. The session will be held between 12:30 and 14:30 and is free! Refreshments will also be provided. Places are extremely limited though, so call the library to book on 01484 414868 or pop in to see us.